#VarunDhawan on Monday nominated #AkshayKumar to complete the #SuiDhaagaChallenge. 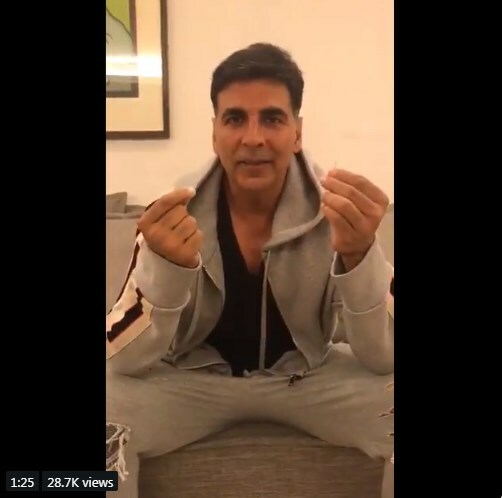 Akshay took to twitter to complete the said #SuiDhaagaChallenge by needling a thread. He tweeted his video and captioned it as, "जिसका काम उसी को साजे और करे तो डंडा बाजे Mauji bhai @Varun_dvn here’s my attempt at the #SuiDhaagaChallenge, not as easy as it looks. I now nominate @sachin_rt"
In the minute and half video Akshay can be seen struggling to needle the thread and even jokes "it would have been easier to do a stunt of jumping from a building but I can't do this". He then nominated cricketer Sachin Tendulkar. Varun when introducing the challenge took to twitter and wrote, "We want to see how fast you can thread a needle! Take on the #SuiDhaagaChallenge & Share your videos on Facebook, Twitter & Instagram tagging @yrf, @suidhaagafilm with #SuiDhaagaChallenge & nominate your friends! Kya aap mein hai woh baat? :D I nominate @akshaykumar"
He also shared a video demonstrating the challenge with costar Anushka who nominated Shahrukh Khan. Sui Dhaaga: Made in India' is a drama directed by Sharat Katariya and produced by Maneesh Sharma under the banner of Yash Raj Films. the film stars Varun Dhawan as a tailor and Anushka Sharma as an embroidery craftswoman. "Sui Dhaaga" will release on September 28.